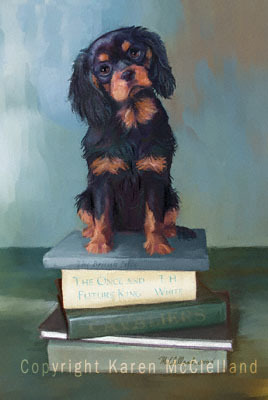 Cavalier King Charles Spaniel limited edition art print, dog painting done by artist Karen McClelland titled "Young Arthur"
Cavalier King Charles Spaniel dog print titled "Young Arthur"
Thirty years ago I read the "The Once and Future King" by T.H. White about the story of young King Arthur. When painting this young Cavalier of English heritage this book came back to mind. In the full size print you can see that's the title of the large white book.Other Cavalier prints. Paintings by Karen McClelland © 2001-2005, All rights reserved Copyright shall at all times remain vested in the Artist. No part of the work shall be used, reproduced, stored in a retrieval system, or transmitted in any form or by any means electronic, mechanical, photocopying, recording or otherwise, without the Artist's express written consent.